The Organization for Economic Cooperation and Development is a Paris-based international bureaucracy. It used to engage in relatively benign activities such as data collection, but now focuses on promoting policies to expand the size and scope of government. That’s troubling, particularly since the biggest share of the OECD’s budget comes from American taxpayers. So we’re subsidizing a bureaucracy that uses our money to advocate policies that will result in even more of our money being redistributed by governments. Adding insult to injury, the OECD’s shift to left-wing advocacy has been accompanied by a lowering of intellectual standards. Here are some recent examples of the bureaucracy’s sloppy and/or dishonest output. Cooperating with leftist ideologues from the AFL-CIO and Occupy movement to advance Obama’s ideologically driven fiscal policies. Given this list of embarrassing errors, you probably won’t be surprised by the OECD’s latest foray into ideology-over-accuracy analysis. As part of its project to impose higher taxes on companies, here’s what the OECD is claiming in a recent release. Corporate tax revenues have been falling across OECD countries since the global economic crisis, putting greater pressure on individual taxpayers… “Corporate taxpayers continue finding ways to pay less, while individuals end up footing the bill,” said Pascal Saint-Amans, director of the OECD Centre for Tax Policy and Administration. “The great majority of all tax rises seen since the crisis have fallen on individuals through higher social security contributions, value added taxes and income taxes. This underlines the urgency of efforts to ensure that corporations pay their fair share.” These efforts are focused on the OECD/G20 Base Erosion and Profit Shifting (BEPS) Project. And what evidence does the OECD have to justify this assertion? Here’s what the bureaucracy wrote. Average revenues from corporate incomes and gains fell from 3.6% to 2.8% of gross domestic product (GDP) over the 2007-14 period. Revenues from individual income tax grew from 8.8% to 8.9% and VAT revenues grew from 6.5% to 6.8% over the same period. Those are relatively small shifts in tax receipts as a share of GDP, so one certainly could say that the OECD bureaucrats are trying to make a mountain out of a molehill. But that would mean that they’re merely guilty of exaggeration. The much bigger problem is that the OECD is disingenuously cherry-picking data, the kind of methodological mendacity you might expect from an intern in the basement of the White House, but not from supposed professionals. 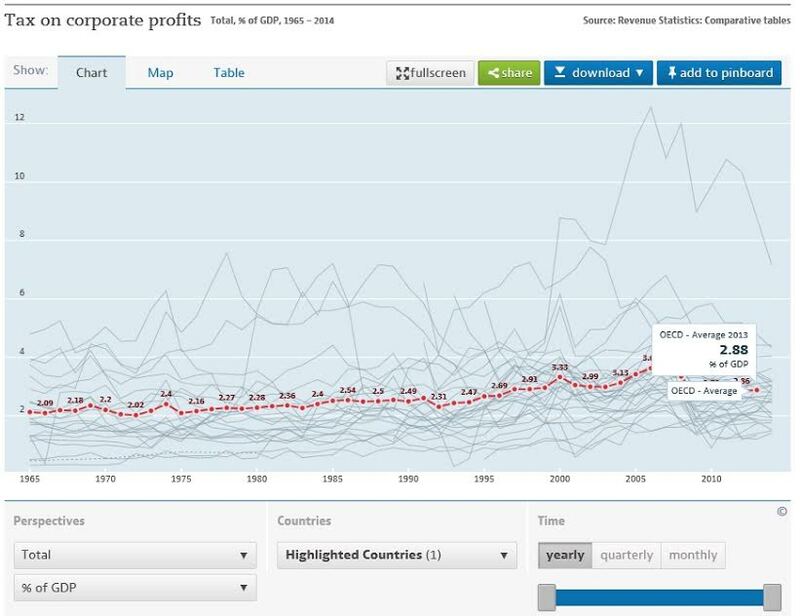 If you go to the OECD’s website and click on the page where the corporate tax data is found, you’ll actually discover that corporate tax receipts have been slowly climbing as a share of GDP. Yes, receipts are slightly lower than they were at the peak of the financial bubble. However, honest analysts would never claim that those numbers were either sustainable or appropriate to use as a bennchmark. Sadly, “honest” and “OECD” are words that don’t really belong together any more. The bureaucrats in Paris also are being mendacious in their portrayal of what’s happening with individual income tax revenues. 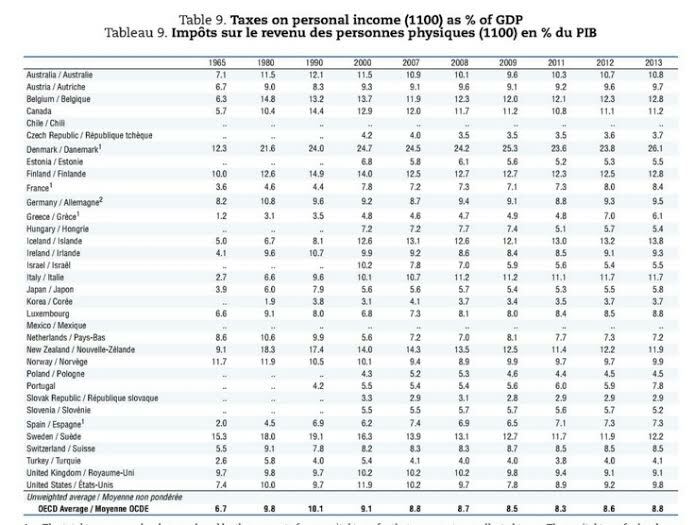 Monsieur Saint-Amans wants us to think that falling corporate tax receipts are being offset by a rising burden on individuals, but check out this table from the OECD’s Revenue Statistics. As you can see, he wants us to look at one tree (what’s happened in the past few years) and ignore the forest (the fact that the burden of the personal income tax today is lower than it was in 1980, 1990, or 2000). By the way, the real story is that the OECD wants higher tax burdens, period. Anytime, anywhere, and on everybody. It’s attack on low-tax jurisdictions is designed to enable higher income tax burdens on individuals. Its “base erosion and profit shifting” project is designed to facilitate higher income tax burdens on companies. And the bureaucrats reflexively advocate higher value-added tax burdens. All of what you might expect from an organization filled with overpaid officials who realize their cosseted lifestyle is dependent on producing output that will generate continuing subsidies from statist politicians such as Obama and Hollande. P.S. If you want an amazing example of the OECD’s ideology-over-analysis approach, here’s what the bureaucrats recently wrote about achieving more growth in Asia. Increasing tax revenues and ensuring sustainable domestic resource mobilisation will be critical as emerging Asian economies seek to boost the provision of public goods and services and improve economic growth and living standards. …Comparable and consistent tax statistics facilitate transparent policy dialogue and provide policy makers with an important tool to assess alternative tax reforms. …Continued reforms will be necessary to help these tax administrations raise additional tax revenues in the future. Yup, you read correctly (at least if you understand that “domestic resource mobilisation” is OECD-speak for higher taxes). The bureaucrats think generating more tax revenue to finance bigger government actually is a recipe for more prosperity. For all intents and purposes, they’re advising nations in the region to copy France and Italy instead of seeking to be more like Hong Kong and Singapore. Though, to be fair, the OECD isn’t just trying to impose bad policy on Asia. The bureaucrats in Paris have an equal-opportunity mindset when advocating statism since that’s the exact same prescription the OECD gave for Latin America.